New reviewer Baron Von Velveteen takes a look back at this timeless masterpiece of rhythm and flow. Although released in 2012, Professor Elemental's The Indifference Engine is as vital to the Steampunk world as ever, and should be required listening for any clock working adventurer. The Professor's hilarious wordcraft--self-described as "Chap Hop"--will no doubt leave you smiling, and downright rolling on the floor as he decimates his rivals. His wordplay is clever, irreverent, and even (politely) abrasive at times. It shows how this particular gentleman rhymer isn't the kind that's afraid to dirty his spats, and ride into battle with the cavalry. Elemental's strategy is best displayed on "Fighting Trousers", where he completely obliterates a rival gentleman rhymer through clever digs, and brilliant song craft. Other note worthy tracks include "Cup of Brown Joy" and "Quest for the Golden Frog", which feature beats that should earn the respect of any post apocalyptic DJ. The beats on this album are half the reason you should\ buy this album now. Reflecting steampunk as a future past, these beats bring that old radio-to-digital sharpness. Using turn of the century pop music, twisted with old-school hip-hop beats, producer Tom Caruana creates a perfect backdrop for Elemental's humor and wit. Much of the genius of this album lies with Caruana, who clearly has a love for great music, and a talent for creating a unique sound that's all the Professor's own. 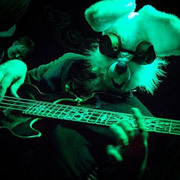 In fact, the beats were good enough to warrant the release an entirely separate instrumental album entitled Elements of the Professor featuring many of the beats found on The Indifference Engine. The Indifference Engine shows Professor Elemental in all his glorious swagger, and I believe has earned him a place as one of the top artists Steampunks all around the world will continue to love. And here's a note of introduction from our new reviewer, Baron Von Velveteen! Being that this is my first review here on Steampunk-music.com, I thought I would take a moment to introduce myself. I don't really mind sharing with you my "angle" as a reviewer. I believe Steampunk, as a genre, is at a definingmoment. Unlike any other genre of music, steampunk has yet to establish a "sound". A quick iTunes search for steampunk will get you folk, to hip-hop, to hard rock, and ambient; it's all over the place. Pirates, Victorians, geeks, and all manner of ex-goths that ditched the black for brown, are moving over to steampunk, and calling it their own. This trend has left a great many people quite confused. For Kthulu's sake, what the hell is steampunk music anyway? Or can any garage band just throw on a top hat and suddenly become steampunk? And to make things even more complicated, there's that whole list of bands that don't call themselves steampunk, but echo through the Aether regardless. Now I don't mind admitting to you all, this Rabbit loves metal. I own virtually every Swedish death metal album from the 90's, and would love to see more bands like Alestorm featured at steampunk conventions. I like music with a bite, an edge, and a slight shade of evil. That being said, I'm also known to sing along to showtunes ... *blushes* I want to be clear, I believe this ambiguity, as to what exactly steampunk is, is a good thing. It's a great thing. It's what makes steampunk such an exciting musical asthetic. Unlike any other genre, steampunk manages to still be a musical genre, while continuing to have something to offer every time traveling adventurer. Which bands call themselves steampunk, and which ones don't, I believe is missing the point. Going forward and writing reviews for this site, my angle is this; I want to put a spotlight on the bands I think steampunks will enjoy.